Former Chicago Mayor Richard Daley knew that his nephew had been involved in a drunken fight that led to the death of David Koschman "shortly after the incident," but he and his contacts did nothing to directly influence the investigation, a special prosecutor indicated in a newly released report. But Dan Webb's report does suggest authorities who were keenly aware of the Daley family connection mismanaged the investigation into the 2004 brawl on Chicago's Division Street. "What's very clear as you read this report is that no phone call needed to be made. Very early on the Chicago Police Department, whether by intuition or by experience of the realities of life in Cook County and the City of Chicago, got the message that this was no ordinary case," Locke Bowman, an attorney for the Koschman family, told reporters Tuesday after the report was made public. Webb's report had been ordered sealed until the trial of Richard J. "R.J." Vanecko, but the Daley nephew pleaded guilty last week for his role in the incident and avoided a trial. He'll serve 60 days in jail, followed by 60 days of home confinement, and must pay $20,000 in restitution. Richard J. “R.J.” Vanecko accepts plea deal in the 2004 death of 21-year-old David Koschman of Mt. Prospect. As part of the special prosecutor's investigation, Daley said he didn't remember when he was notified of his nephew's involvement, but both the investigating officer, Det. Ronald Yawger, and Thomas Epach, the executive assistant to then-police Supt. Phil Cline, in 2004 tried to persuade the Cook County State's Attorney's Office to approve a charge of involuntary manslaughter. The head of Felony Review, Darren O'Brien, "could not be persuaded to do so," the report states. "What happened here was an investigation that was treated as a political football from Day One," Bowman said. "[David Koschman's mother Nanci Koschman] was left in the sidelines in the dark while police and prosecutors focused on covering themselves from allegations that they might be responsible for criminally charging a Daley family member." 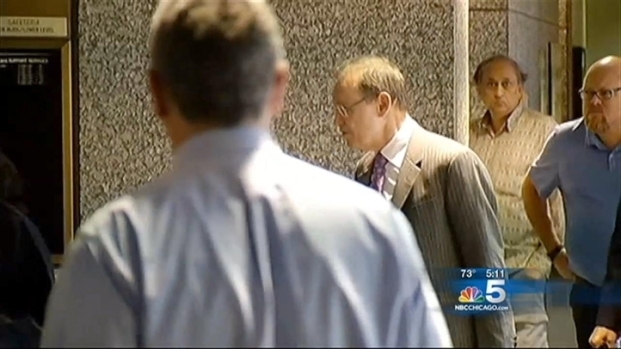 Carol Marin reports from the NBC 5 studio on a development in the R.J. Vanecko case. Attorneys for NBC5 and the Chicago Sun-Times have filed a request to remove the seal on the grand jury report regarding the death of David Koschman. Special Prosecutor Dan Webb asked in September that his 17-month grand jury probe be sealed. Presiding Judge Michael Toomin agreed. Webb's report details missing files from both the police department and the state's attorney's office. When Vanecko was indicted by Webb, State's Attorney Anita Alvarez said her office had previously convened a grand jury to investigate. But according to Webb's report, prior to his appointment, Alvarez's office had "presented one witness and one statement of a witness." During the 2011 reinvestigation, members of Daley's staff met with police officers and said they expected the case to be "closed soon." In a press release accompanying Tuesday's release, Webb said "there was no evidence that former Mayor Daley, his family, or others at their direction engaged in conduct to influence or attempted to influence, the investigations which [the Chicago Police Department] and [the Cook County State's Attorney's Office] conducted in connection with the Koschman matter." Despite Webb's findings, Bowman said he believes it is "fair to conclude here... that in fact that this was an example of supreme clout and that the Koschman family would have gotten justice a decade ago if it weren't for who threw the punch and whose family that puncher came from." Daley, the city's longest-serving mayor, left office in 2011. Koschman, who was 21 at the time, was knocked down and struck his head after being punched on the street. Fueled by reports from NBC Chicago and the Chicago Sun-Times, questions were raised about whether clout caused Cook County prosecutors and Chicago police to mishandle the original investigation. Koschman's family claimed there was a cover-up. Webb wrote that when re-examining the case's handling, he primarily looked at whether one of four laws had been broken: official misconduct, obstructing justice, conspiracy, and tampering with public records. Because each has a three-year statute of limitations, none could have been applied to the handling of the original 2004 investigation, he wrote, also citing a lack of potentially vital evidence, including emails and cellphone records. And while reopened investigations in 2011 and 2012 were not subject to the statute of limitations, the report concluded that charges couldn't be filed against any of the investigators. "The Special Prosecutor does not believe he could prove beyond a reasonable doubt by legally sufficient evidence at trial that any employee of (the Chicago police) or (prosecutor's office) acted with the requisite criminal intent ... to violate Illinois law," it said. Still, Bowman said he hopes the new light shed on the case turns it into a "teachable moment," and said further accountability is needed. "The Koschman investigation cries out for an examination on the part of people who care about justice in the city of Chicago," he said. "Somebody needs to get on top of this and heads need to roll."